When it comes to dessert, reach for simple recipes like these spiced apple cupcakes with caramel cream cheese frosting, and get ready to indulge in your favorite fall flavors! Heat oven to 350 degrees, then line 24 regular-size muffin cups with paper baking cups or grease cups with shortening. In large mixing bowl on medium speed, beat the butter and sugar together until light and fluffy, around 5 minutes. Beat in the eggs until thoroughly incorporated, then slowly add the applesauce, apple juice, and vanilla. In a medium bowl, sift together the flour, baking soda, baking powder, salt, cinnamon, ginger, and nutmeg, then add it to the wet ingredient in three batches, mixing until just combined. Divide the batter between the muffin cups, filling them about 3/4 full, and bake for 15 minutes, or until a toothpick inserted into the center comes out clean. Cool completely. In a large mixing bowl, beat together the cream cheese, butter, and vanilla until light and fluffy, then slowly mix in the powdered sugar until fully incorporated. Add the caramel sauce and gently stir to combine. 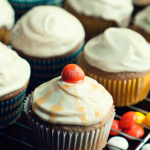 Frost each cupcake, then top with some M&M's and enjoy!